From 1952 to 1962, Cessna, which is familiar for its light airplanes and business jets, was active in the helicopter marketplace. It achieved this with the CH-1 Shyhook, which was its first, and also last, attempt to develop helicopters. Cessna bought its helicopter know-how by acquiring Siebel. Indeed, much of the CH-1 technology was derived directly from the Siebel S-4B helicopter. 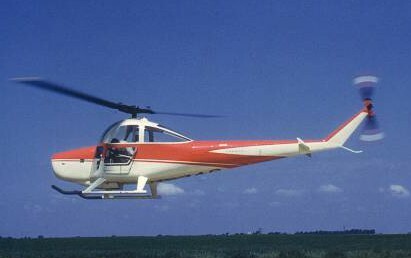 The Cessna CH-1 is an all metal, light, single-engine helicopter. The engine is mounted in front and the fuselage very much resembles the well known Cessna light airplane design. The shaft that drives the main rotors runs straight up through the cabin, between the two front seats. The first prototypes were evaluated by the US Army (designation YH-41), and although it was enthusiastic about the flying characteristics, it did not put the model into service due to its lack of an adequate lifting capability and the complex maintenance routines. After the military turned down the CH-1, Cessna evaluated the civil market, but decided that it was not yet mature enough for civil light helicopters to be commercially attractive. Consequently, Cessna left the helicopter market to others. However, other sources (among them Rex Trailer) have claimed that major problems with the transmission played a key role in the company’s decision. This theory is supported by the fact that Cessna bought most models back from its customers and withdrew the certificate of airworthiness, thus preventing further accidents and protecting the Cessna brand. Do you want to comment the Cessna CH-1 helicopter?